CappWash plate washer is an ideal ELISA plate washer for small-scale work. 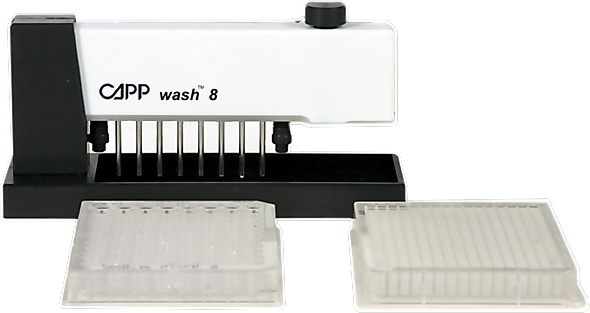 Simple, compact and inexpensive, Capp ELISA plate washer is available in an 8-channel, a 12-channel, and a 16-channel version, as well as in form of a 6-channel TubeWash - manual washer for 12x75mm test tubes. The unique Two-in-One Design of Capp ELISA plate washer gives each tube 2 functions - delivery of the washing solution to the well and aspiration of the used solution back to the waste collection bottle. Each tube of Capp ELISA plate washer consists of an inner tube that releases the distilled water washing solution into the wells for rinsing while the outer tube vacuums away the liquid upon completion of the washing procedure. Capp ELISA plate washers do not require any programming or electrical wiring connections. They are made of a high-grade stainless steel and polypropylene. Each unit is fully autoclavable and highly resistant to aggressive chemicals. 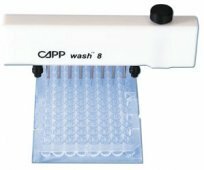 CappWash is one of the best options for quickly and easily washing ELISA plates, 96-well plates and 384-well plates. The Capp plate washer can be purchased individually, as a set, including all components necessary for the setup, or with chosen components only. CappWash Press Release: The former Nunc® immuno washer is now available as CappWash.